Jewish sages taught that Mordechai saved gentiles. A tale for our times. Ancient Jewish sages taught that Mordechai the Jew saved gentiles, too. This is a tale for our times. 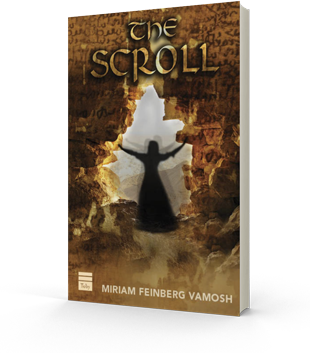 There’s no holiday like Purim to combine a story of the survival of the Jewish people against the enemy all around, women’s empowerment, an odious villain whose name we drown out with noisemakers, and kings, queens and courtiers in a glittering palace setting. It’s a holiday just begging to be celebrated with revelry and costume (and food of course). But this, for a change, I hope, is not about that. This is about an issue with us now that no amount of noise-making can drown out. An article by Talmudic scholar Yakov Z. Meyer for Purim 2010 that appeared in Haaretz opened my eyes to this issue: Early in the Book of Esther, which we read last night in Jerusalem synagogues, we’ve got what seems to be a literary device – how to place Esther squarely in the sights of King Ahasuerus as more than the beautiful virgin after whom he lusted, to replace Vashti, who refused to be a victim of his drunken bidding. Esther’s cousin Mordecai, lurking around the gates of the palace in which he has insinuated his comely cousin, hears two of King Ahasuerus’ guards plotting to kill the sovereign. Mordecai gets word to Esther, who reports it to the king, who has the two traitors executed. 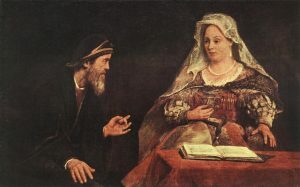 Mordecai and Esther (Aert de Gelder, 1645-1727). Museum of Fine Arts Budapest/Wikimedia. According to Meyer, Rabbi Judah cites Psalm 119:100: “I am wiser than my elders” (I quote the translation of this verse, in Hebrew: mizkenim etbonan, rather than the translation that appeared in Meyer’s article, but either translation makes the point.) We are to understand that Rabbi Judah is saying in Mordecai’s name: “I can do even better than those who came before me who helped non-Jews; I’ll save this non-Jew’s life.” Rabbi Judah’s interlocutor, Rabbi Nehemiah, quotes from Genesis 12:3, where God tells Abraham: “In thee shall all the families of the earth be blessed” (Gen. 12:3). Thus, Meyer says, God defines not only the relationship between Abraham and his descendants, but between us and the other, which to me means those not of our culture, faith or nation. That relationship is one in which we endeavor to bless the other by our actions. According to Meyer, the midrash asks a question, why should Mordecai help non-Jews, that might mislead us into thinking this passage is ethnocentric, to say the least, only to give the answer that Jews are obliged to be anything but. People don’t know that this isn’t the whole statement, and believe it means the ancient sages who interpreted the Bible are giving them license to delay or avoid caring for a person of a different race, religion, or nationality. Such a dictum would certainly mean Mordecai should not have warned a non-Jewish king of his impending assassination. Only when we take the verse in its entirety can we recognize and appreciate the ancient Jewish commitment to care for all in need. Anything else, anything less, is a masquerade fit only for a drunken Purim party. I thank each and every member of my recent tour group from The Chapel, St. Joseph, Michigan, so ably led by Pastor Phil Bubar, for their warmth and love for the Jewish people and our customs, for celebrating Purim with me in Jerusalem this year. I republish this Purim blog in their honor. 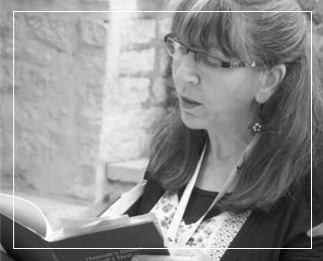 Thank You, Miriam, for acknowledging The Chapel Group with the dedication of your Purim blog entry, March 22, 2019. You indeed “blessed others by your actions” with your total immersion into educating our group. But more importantly, you oozed into us a great love of Israel and the Jewish people from which comes our great Christian heritage. Thank You for your “commitment to care”.